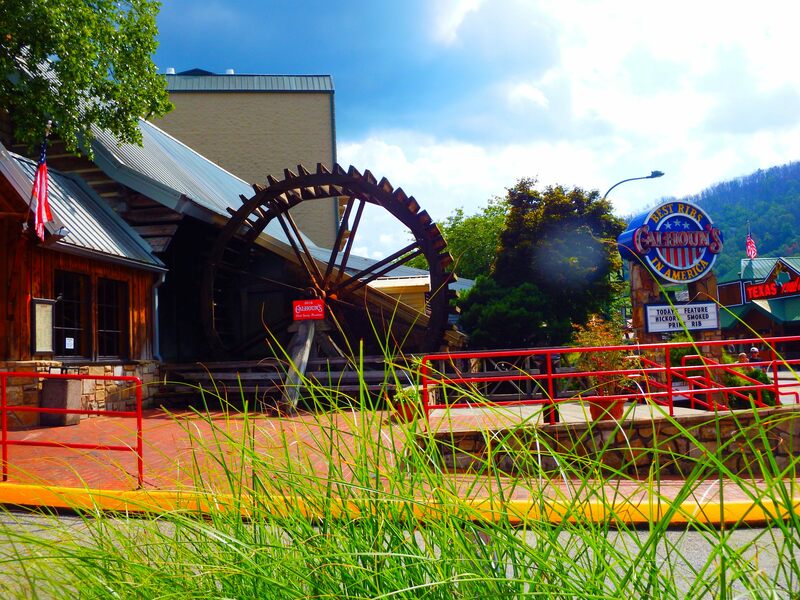 Gatlinburg Restaurants have a special kind of environment to make your dining experience in Gatlinburg a special one. HUNGRY BEAR BBQ If you're as "hungry as a bear" you need to head to Hungry Bear BBQ. This cafe-style diner is small in structure but big on delicious food! Their ribs, pork, chicken, and beef will melt in your mouth. 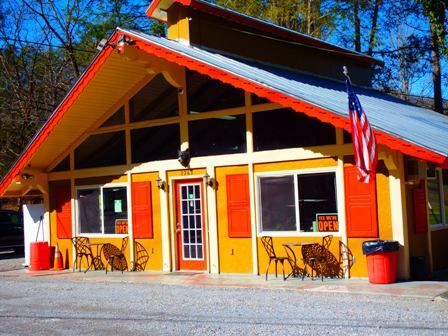 They serve delicious southern-style side dishes, soft drinks, snacks and wonderful desserts. The kids have their own special menu while adults enjoy lunch and dinner at reasonable prices. 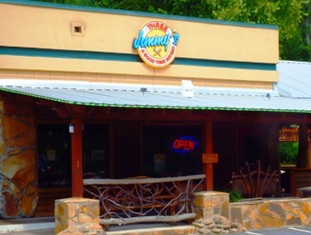 The Hungry Bear is located at 2263 E. Parkway in Gatlinburg. WHITE OAK FLATS COFFEE BREW HOUSE A wonderful meal begins with a fine cup of coffee. You can enjoy both at the White Oak Flats Coffee Brew House. 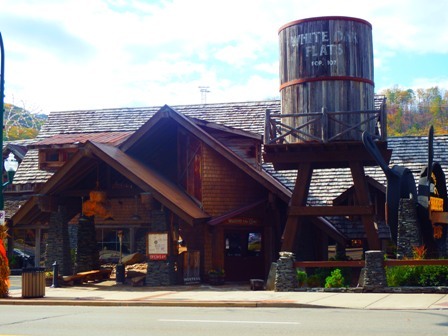 Located downtown, this Gatlinburg restaurant is easy to find because of it's unique structure. They are open for breakfast and lunch, and offer American cuisine. This family style restaurant offers great food at reasonable rates. You'll find plenty of fresh baked goods, snacks, and a special area where arts and crafts are sold. This restaurant is open Tuesday - Saturday. Any of these gatlinburg restaurants are sure to please ! LOG CABIN PANCAKE HOUSE This is the place where friends meet! This cozy Gatlinburg restaurant is filled with lots of fun, laughter, and friendly folks. The spacious dining area offers a comfortable setting while you enjoy plenty of good food from their all-you-can-eat soup and salad bar. 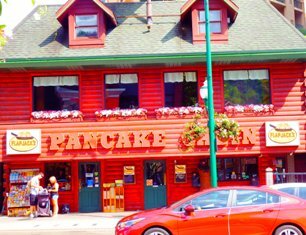 The Log Cabin Pancake House is always a popular spot for breakfast! They have a huge selection of pancakes and waffles of most every kind! There's eggs, country ham, sausage, biscuits, gravy, and more. If you choose to sleep in, show up later and enjoy a hot lunch buffet, hamburgers, and country-style dinners. This restaurant is on the Historic Nature Trail - Airport Road. BUBBA GUMP SHRIMP COMPANY It's one of Gatlinburg's most popular restaurants! Located on the main strip, this unique restaurant is more than just a place to eat, it's a real adventure. 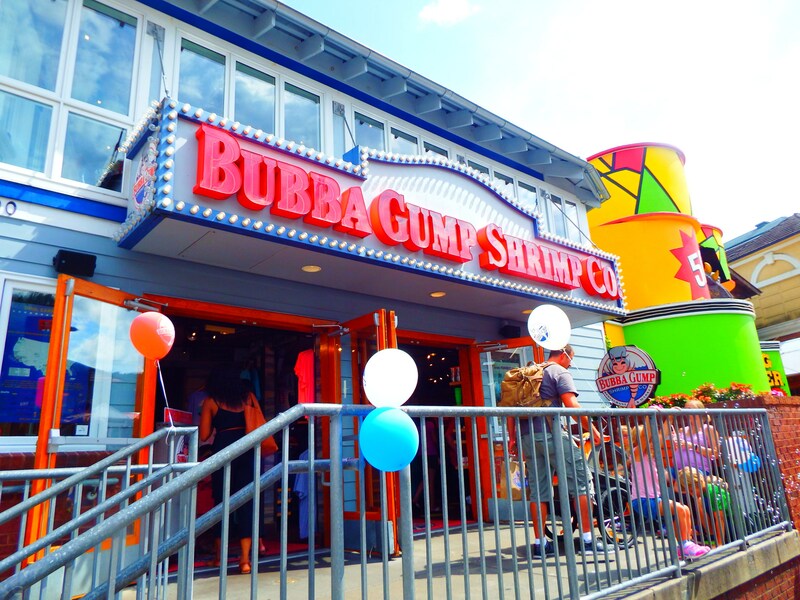 Based on the movie, "Bubba Gump Shrimp Company" offers a twist you won't find anywhere else. You'll enjoy interesting wait service, paraphernalia from the movie, and a gift shop. But most importantly, you'll enjoy some of the best steaks and seafood you ever "set your mouth to!" You'll find Bubba Gump at 900 Parkway at traffic light #8 in Gatlinburg. FLAPJACK PANCAKE CABIN is a "morning tradition made from scratch!" It's the perfect place to enjoy breakfast in Gatlinburg! The menu is filled with delicious breakfast meals to fuel your energy for the entire day. Choose from delightful platters like The Wonderland Breakfast, Fried Steak & Egg, Eggs & Cakes, the Cabin Breakfast and more. Enjoy their fine selection of pancakes, and omlettes. For those of you who are health conscience, there's a great "Better For You" menu that is sure to please. 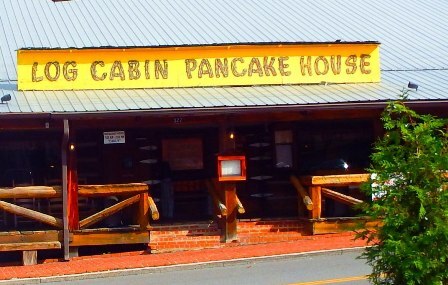 FlapJack's Pancake Cabin has three locations in Gatlinburg, one in Pigeon Forge, one in Sevierville, and one in Kodak. JOE'S AND POP'S SUB SHOPPE is an excellent choice if you're looking for a good sandwich! These subs are always made fresh! They have a huge menu selection that includes specialty subs, specialty sandwiches, or you can create you're own! There's a delicious kid's menu and a fine selection of sides and salads. 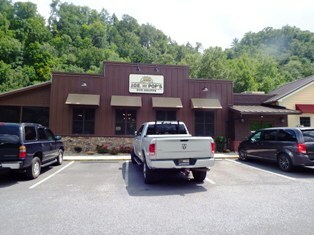 This Gatlinburg restaurant is located at 1244 East Broadway near Rocky Top Sports World. FIVE GUYS is a highly rated place to eat in the Great Smoky Mountains areas with locations in both Gatlinburg and Pigeon Forge. It's the place to go for FREE peanuts. It's also the best pick for big, juicy hamburgers and delicious hand-cut french fries. The menu offers a kid's menu, great choices whether you have a big appetite or a small one. 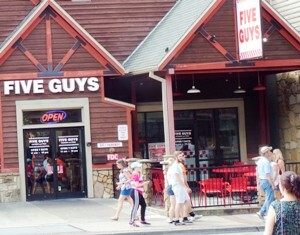 Five Guys is located at 815 Parkway - Gatlinburg. 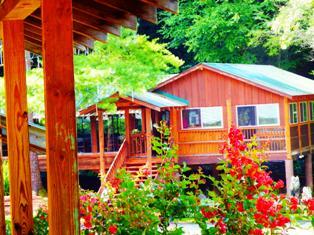 CRYSTELLE CREEK is Gatlinburg's fine dining at it's best! It's a steak house and Italian restaurant all in one. If you enjoy trout, steaks, seafood, ribs, chicken, catfish and more then Crystelle Creek & Grill is the choice for you! There atmosphere is pleasant. There's free parking on two levels and the Gatlinburg Trolley makes stops here. Crystelle Creek has a beautiful setting. My favorite is the beautiful cascading 150 foot tree that sits outside. It hangs full of lighted crystals which makes this restaurant a real showplace at night. This restaurant is family friendly, dog friendly and has a sports porch. 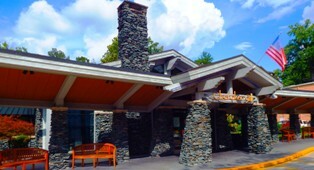 Crystelle Creek is located at 1654 East Broadway in Gatlinburg.